Since the early 1990s Asian vulture populations have undergone catastrophic declines, mainly in their centre of distribution on the Indian subcontinent. Four species, White-rumped Vulture (Gyps bengalensis), Cliff Vulture (Gyps indicus), Slender-billed Vulture (Gyps tenuirostris) and Red-headed Vulture (Sarcogyps calvus) are now on the brink of extinction. Extensive research has identified the cause of the declines to be the veterinary form of Diclofenac, an anti-inflammatory drug commonly administered to domestic livestock in Asia. Vultures are exposed to the drug when they consume carcasses of animals that were treated with Diclofenac. The drug is highly toxic to vultures, causing death due to kidney failure. The vulture population crash is having wide ecological, economical and social consequences, for example because vultures play a vital role in the ecosystem by rapidly disposing of carcasses that would otherwise pose a risk of disease. With the decline of vultures in south Asia, the Indochinese deciduous dipterocarp forest landscape, remaining predominantly in the northern and eastern plains of Cambodia, now supports globally significant populations of the three critically endangered species occurring here (White-rumped, Slender-billed and Red-headed Vulture). In this region vultures have also declined significantly, but this decline occurred gradually in the course of the 20th century and is not related to Diclofenac, as the drug is currently not available in the region. The main limiting factor for vultures in Cambodia is low food availability, due to the demise of wild ungulate populations and the lack of free-ranging domestic cattle. Deciduous dipterocarp forest, a key habitat for conservation in South East Asia, is therefore one of the only landscapes of Asia where vulture populations are stable and Diclofenac is not currently a threat to their survival. 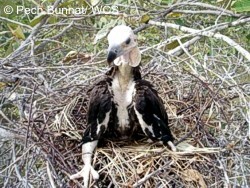 In 2004, led by the Wildlife Conservation Society (WCS), the Cambodia Vulture Conservation Project was initiated, in collaboration with a coalition of international NGOs (WCS, BirdLife International & RSPB, and WWF) and the two relevant Cambodian government agencies (Ministry of Agriculture, Forestry and Fisheries and Ministry of Environment). After an initial period of basic research, the Cambodian Vulture Action Plan was formulated and recommendations to protect and restore vulture populations in Cambodia began to be implemented. The main components are the maintaining of so-called vulture restaurants (i.e. semi-permanent feeding stations) across the vulture range to provide supplementary food and facilitate population monitoring, annual vulture counts, nest searching and protection schemes, and regular surveys for the presence of Diclofenac in the country. The ACCB became an official partner in the vulture project in 2007, funding at first the westernmost of the seven feeding stations in Cambodia within the Kulen Promtep Wildlife Sanctuary, as well as ongoing vulture research and protection activities in this area. 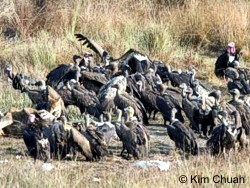 Since 2010, the vulture restaurant at Sesan in Stung Treng Province in Northeast Cambodia is financed by ACCB. Since 2008, ACCB supports wildlife monitoring and bird nest protection activities of the Wildlife Conservation Society (WCS) in the Kulen Promtep Wildlife Sanctuary in Preah Vihear Province in northern Cambodia. 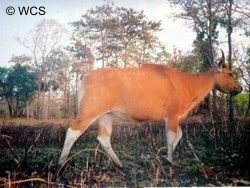 The Northern Plains of Cambodia support the last large tracts of open deciduous dipterocarp forest, with interspersed mixed and riparian vegetation and blocks of lowland evergreen forest. 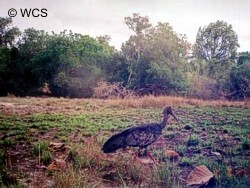 Apart from globally threatened mammals, such as Banteng (Bos javanicus), Gaur (Bos gaurus), Dhole (Cuon alpinus) and a number of primate species, the Northern Plains host breeding populations of various globally threatened large waterbirds, amongst them some of the world’s rarest birds, including the critically endangered White-shouldered Ibis (Pseudibis davisoni) and Giant Ibis (Pseudibis gigantea), Greater Adjutant (Leptoptilos dubius), Lesser Adjutant (Leptoptilos javanicus), Black-necked (Ephippiorhynchus asiaticus) and Woolly-necked Stork (Ciconia episcopus), Sarus Crane (Grus antigone), White-winged Duck (Cairina scutulata) and Oriental Darter (Anhinga melanogaster). Globally threatened Green Peafowl (Pavo muticus) and three critically endangered vulture species, White-rumped (Gyps bengalensis), Slender-billed (Gyps tenuirostris) and Red-headed Vulture (Sarcogyps calvus), are also residents of these forests. Most of these large birds are threatened by human disturbance and collection of chicks and eggs for local consumption and the international illegal wildlife trade. Adjutants and Sarus Cranes are most sought after, and in particular the latter can fetch a high price when sold in nearby Thailand. Despite the low human population density, the flat, open forests of the Northern Plains are heavily used by local people for resin-tapping and collection of other forest products, fishing, cattle-grazing and hunting. 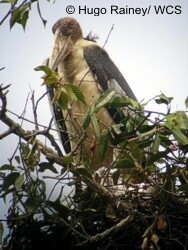 As it would be impossible for Wildlife Sanctuary staff to monitor and police the entire vast forest, and a much greater number of nests can actually be found and successfully protected by working in cooperation with the local communities, WCS has established the Northern Plains Bird Nest Protection Scheme. In this scheme local people are offered a reward for reporting nests, and are often employed to monitor and protect the birds until the chicks successfully fledge. Offering such incentives for conservation, so-called ‘direct payments’, is an effective and cost-efficient way of protecting globally threatened large waterbirds and ensuring that large numbers of them breed successfully in the Kulen Promtep Wildlife Sanctuary. The payments are highly significant in remote rural villages and, apart from helping to build support and awareness for conservation, are used to buy food, clothes, education and for house improvements. Moreover, as local people learn the ‘legal’ conservation value of the species, illegal hunting and trade decreases. The incentive scheme is also linked with the development of community-managed key species ecotourism. This link of successful development of ecotourism with community livelihoods and conservation of threatened species reinforces the impact of the incentive scheme and ensures long term sustainability, as greater numbers of paying tourists increase community income and therefore provide further incentive for communities to support waterbird conservation. To arrange visits to those sites please visit Sam Veasna Center. Wildlife Sanctuary staff regularly conduct awareness-raising activities in local villages to inform people about the nest protection scheme and the importance of conserving these key species. They also conduct enforcement activities against wildlife traders and monitor local and border markets. Additionally, on a regular basis the rangers visit every nest that is being monitored to measure breeding success and conduct other research, which generates important information about these globally threatened species.